Randolph students have a number of different ways to get involved on campus and in the Lynchburg community. Student Engagement encompasses Student Government, Student Organizations, the Macon Activities Council, and a number of campus and community events! 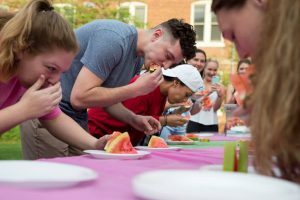 How can you get involved at Randolph through Student Activities? Disc Golf A challenging nine-hole disc golf course winds through the Dell on back campus.